Give the gift of hope this holiday season by purchasing an official ALS donation certificate from the 90 Foundation. Each certificate is printed and presented in a gift envelope and makes a perfect gift for the season of giving. Purchase in honor of a loved one lost, a loved one who is currently fighting and all the people diagnosed every 90 minutes. 90 Foundation is a not for profit 501c3 dedicated to funding the most promising research for the treatment and cure of ALS. You can rest assured that every dollar donated goes towards supporting current and ongoing ALS research. Every donation is tax deductible and will help our fight to end ALS. 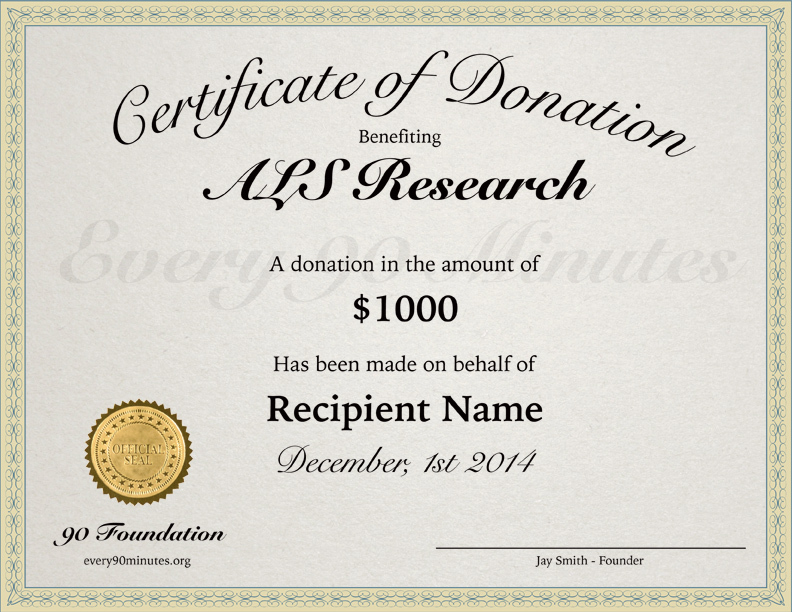 To purchase a ALS Research Certificate click the buy now button, enter the recipients name, the amount (suggested, $25-$1000) and enter your shipping information. We will send you the certificate via first class mail.